In an ongoing quest to replace its badly aging fleet of Warsaw Pact-era MiG-21 Lancer fighter aircraft, Romania continues to scour the secondhand market for an additional batch of F-16s with which to bolster its incoming stock of ex-Portuguese fighters. Since joining NATO in 2004, Romania has sought to gradually shed some of its Soviet-legacy hardware and modernize its military with Alliance-standard equipment. The fighter component represented a major cornerstone of Romania’s three-phase Force Transformation Strategy modernization effort (covering the period between 2006 and 2025) that was unveiled in 2006. Efforts to find a successor to the MiG-21 Lancer fleet had begun a year earlier, in 2005, when the Ministry of Defense began evaluating affordable alternatives. These alternatives included a rundown of cheap secondhand options (used Israeli F-16s) as well as offers from vendors pitching new-build fighters, including Boeing with its F/A-18E/F Super Hornet, Eurofighter with its Typhoon, France’s Dassault with its Rafale, and Sweden’s Saab with its JAS 39C/D. In the end, however, Romania’s cash-poor coffers simply did not provide successive governments with the necessary finances with which to make a fighter acquisition. Growth in the developing market economy of post-communist Romania took a major hit in 2009 with the global economic downturn. As the nation’s GDP contracted by 7.2 percent, Bucharest had to turn to a triumvirate consisting of the European Union, International Monetary Fund and World Bank to provide it with a EUR20 billion loan. In return Romania was required to meet the terms laid down by the lenders, which included public spending cuts. The added pressure on Romania’s already lackluster defense budget resulted in the Ministry of Defense having to push the long-sought acquisition to the right year after year. All the while, the existing MiG-21 fleet continued to undergo wear and tear. Originally planned for retirement between 2011 and 2012, the fleet has instead been tasked with continuing operations until at least 2017 (around the time when their service lives are expected to expire). 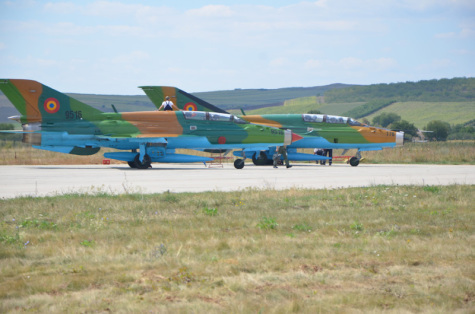 Recognizing the need to quickly put in place a plan for a future MiG-21 replacement, Romania’s principal defense coordinating body, the CSAT, led by then-President Traian Basescu, approved a 24-unit secondhand acquisition on March 23, 2010, at a cost of $1.3 billion. But with the measure still awaiting the necessary legislative approval, Saab and Eurofighter stepped into the fray and decried the lack of an open tender in the nascent CSAT measure. Ultimately, both the Eurofighter consortium and Saab were allowed to make another pitch, but despite their generous offers – each involving 100 percent in offsets, plus training and logistics packages – Romania’s lingering financial difficulties continued to push the Ministry of Defense toward the secondhand F-16 option. In its search for a MiG successor, Romania needed to decide not only the type of aircraft to be procured but also the number. Upon joining the Alliance, Romania had promised it would field a combat aircraft fleet of 48 NATO-compatible fighters. But by 2012 it was clear that this commitment was financially untenable, particularly if involving new-build platforms. Thus the preferred option was secondhand F-16s offered by fellow Euro-NATO allies Portugal and the Netherlands. In 2012, the Romanian government ultimately settled on 12 of Portugal’s redundant F-16 jet fighters (acquired from the U.S. in 1999 under the Peace Atlantis II program). These are being upgraded by Lockheed Martin prior to delivery, which will begin in September. Yet the issue of quantity remains. Having only met one-quarter of its NATO commitment, Romania seeks to purchase 12 additional used F-16s next year. This purchase would represent the second of a three-phase fighter procurement plan approved by the CSAT back in October 2012. The third phase, which is the most financially ambitious, involves replacing all of the combat aircraft in the Romanian Air Force inventory with a fifth-generation fighter starting in 2030. That goal appears as far away as ever, however. In the meantime, Romania’s former commitment to a 48-unit NATO-compatible fighter fleet has instead shrunk in parallel with much of the air combat capacity of Europe’s other Alliance members.